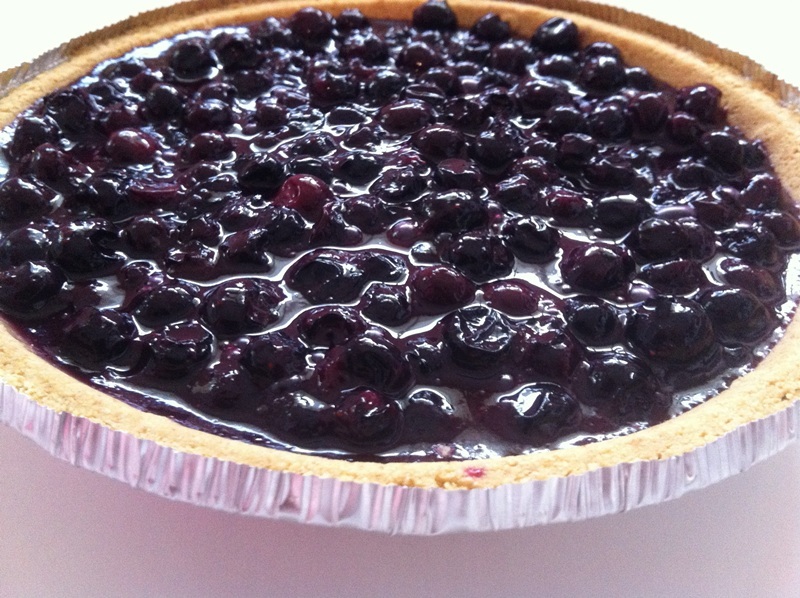 Summer brings an abundance of American blueberries, and too much heat to turn on the oven. This pie requires no baking–just a few minutes of cooking–and it’s so very easy. Honeymaid and Keebler both make good graham-cracker crusts, but avoid their low-fat versions and the Target-brand crusts, which are slightly tastier than sweetened cardboard. — In a large saucepan, combine the sugar, cornstarch, and salt. Mix well. Gradually add the water, stir until smooth. Stir in 1 pint (2 cups) of blueberries, and bring to a boil over medium heat. Cook and stir for 2 to 3 minutes, until the mixture thickens. Stir in the other 1 pint of blueberries, and cook for 1 minute more. Remove from heat and let the mixture cool to less than 100° F.
Spoon the mixture into the graham-cracker crust, and refrigerate for 1 to 2 hours. Serve with a very light dusting of freshly-grated nutmeg, and if you wish, Redi-Whip whipped cream.